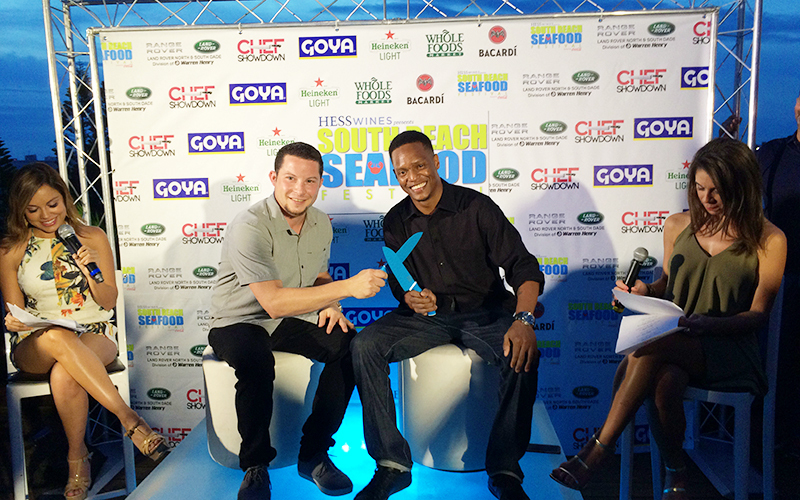 The South Beach Seafood Festival is coming up and you don’t want to miss The Chef Showdown event. Twelve Chefs will compete in six battles and you are the judge. Your vote will pick the night’s champion! It’s all going down on Friday, October 23rd at Lummus Park located at 7th & Ocean Drive, Miami Beach. This past Monday, the Sobe Seafood Fest put together a preview event of the Chef Showdown at the Dream Hotel in South Beach. I got to hangout with fellow bloggers Geoff from Miami Food Pug, Elizabeth from Little Moments of Happpiness, Mirtle from Latina Food Chronicles, Robert from Soul of Miami and Stacy from Best Food Miami. We met the battling chefs and tasted yummy bites by Naked Taco’s Chef Ralph Pagano. Everything I tried was delicious including the fish tacos with mango and cilantro sauce, pot stickers, mango ceviche with plantain, and chicken empanadas. NBC6’s Kelly Blanco and Erika Delgado announced the showdown pairings and got the Chefs ready to battle. Do you have YOUR tickets yet? The VIP Chef Showdown always sells out, so don’t wait! If you want to grab your tickets before they sell out, go to sbsf.wantickets.com and make sure to use the discount code: CGLOVE to get 20% off your tickets.